Homeostasis is maintained by the body’s responses to adverse stimuli, ensuring maintenance of an optimal physiological environment. Homeostatic control mechanisms have at least three interdependent components: a receptor, integrating center, and effector. The receptor senses environmental stimuli, sending the information to the integrating center. The integrating center, generally a region of the brain called the hypothalamus, signals an effector (e.g. muscles or an organ ) to respond to the stimuli. Positive feedback enhances or accelerates output created by an activated stimulus. Platelet aggregation and accumulation in response to injury is an example of positive feedback. Negative feedback brings a system back to its level of normal functioning. Adjustments of blood pressure, metabolism, and body temperature are all negative feedback. homeostasis: The ability of a system or living organism to adjust its internal environment to maintain a stable equilibrium, such as the ability of warm-blooded animals to maintain a constant body temperature. negative feedback: A feedback loop in which the output of a system reduces the activity that causes that output. positive feedback: A feedback loop in which the output of a system is increased by the mechanism’s own influence on the system that creates that output. When an individual doesn’t have enough to eat, the body adjusts by slowing down metabolism so that he or she expends fewer calories. This adaptation conserves the limited energy available from the inadequate diet. A sensor or receptor detects changes in the internal or external environment. An example is peripheral chemoreceptors, which detect changes in blood pH. The integrating center or control center receives information from the sensors and initiates the response to maintain homeostasis. The most important example is the hypothalamus, a region of the brain that controls everything from body temperature to heart rate, blood pressure, satiety (fullness), and circadian rhythms (sleep and wake cycles). An effector is any organ or tissue that receives information from the integrating center and acts to bring about the changes needed to maintain homeostasis. One example is the kidney, which retains water if blood pressure is too low. The sensors, integrating center, and effectors are the basic components of every homeostatic response. Positive and negative feedback are more complicated mechanisms that enable these three basic components to maintain homeostasis for more complex physiological processes. Positive feedback is a mechanism in which an output is enhanced in order to maintain homeostasis. Positive feedback mechanisms are designed to accelerate or enhance the output created by a stimulus that has already been activated. Positive feedback mechanisms are designed to push levels out of normal ranges. To achieve this, a series of events initiates a cascading process that builds to increase the effect of the stimulus. This process can be beneficial but is rarely used because it may become uncontrollable. A positive feedback example is blood platelet accumulation and aggregation, which in turn causes blood clotting in response to an injury of the blood vessels. Negative feedback mechanisms reduce output or activity to return an organ or system to its normal range of functioning. Regulation of blood pressure is an example of negative feedback. Blood vessels have sensors called baroreceptors that detect if blood pressure is too high or too low and send a signal to the hypothalamus. The hypothalamus then sends a message to the heart, blood vessels, and kidneys, which act as effectors in blood pressure regulation. If blood pressure is too high, the heart rate decreases as the blood vessels increase in diameter ( vasodilation ), while the kidneys retain less water. These changes would cause the blood pressure to return to its normal range. The process reverses when blood pressure decreases, causing blood vessels to constrict and the kidney to increase water retention. Temperature control is another negative feedback mechanism. Nerve cells relay information about body temperature to the hypothalamus. The hypothalamus then signals several effectors to return the body temperature to 37 degrees Celsius (the set point). The effectors may signal the sweat glands to cool the skin and stimulate vasodilation so the body can give off more heat. If body temperature is below the set point, muscles shiver to generate heat and the constriction of the blood vessels helps the body retain heat. This example is very complex because the hypothalamus can change the body’s temperature set point, such as raising it during a fever to help fight an infection. Both internal and external events can induce negative feedback mechanisms. Homeostatic Control: This image illustrates the feedback mechanisms of homeostatic controls. If positive and negative feedback loops are affected or altered, homeostatic imbalance and resultant complications can occur. Many diseases are a result of homeostatic imbalance, an inability of the body to restore a functional, stable internal environment. Aging is a source of homeostatic imbalance as the control mechanisms of the feedback loops lose their efficiency, which can cause heart failure. Diseases that result from a homeostatic imbalance include heart failure and diabetes, but many more examples exist. Diabetes occurs when the control mechanism for insulin becomes imbalanced, either because there is a deficiency of insulin or because cells have become resistant to insulin. Homeostasis is the ability of a system to regulate its internal environment through maintaining a stable, relatively constant set of properties such as temperature and pH. diabetes: A group of metabolic diseases in which a person or animal has high blood sugar due to an inability to produce, metabolize, or respond to insulin. blood sugar regulation: Carbohydrate and fat metabolism are regulated by insulin, a hormone produced by the pancreas. Disease is any failure of normal physiological function that leads to negative symptoms. While disease is often a result of infection or injury, most diseases involve the disruption of normal homeostasis. Anything that prevents positive or negative feedback from working correctly could lead to disease if the mechanisms of disruption become strong enough. Aging is a general example of disease as a result of homeostatic imbalance. As an organism ages, weakening of feedback loops gradually results in an unstable internal environment. This lack of homeostasis increases the risk for illness and is responsible for the physical changes associated with aging. 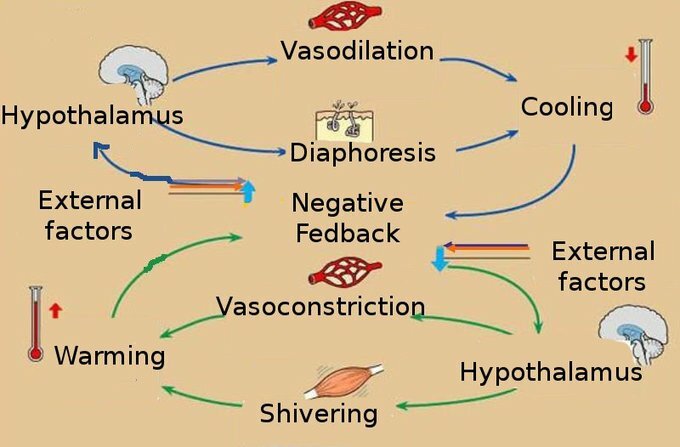 Heart failure is the result of negative feedback mechanisms that become overwhelmed, allowing destructive positive feedback mechanisms to compensate for the failed feedback mechanisms. This leads to high blood pressure and enlargement of the heart, which eventually becomes too stiff to pump blood effectively, resulting in heart failure. Severe heart failure can be fatal. Diabetes, a metabolic disorder caused by excess blood glucose levels, is a key example of disease caused by failed homeostasis. In ideal circumstances, homeostatic control mechanisms should prevent this imbalance from occurring. However, in some people, the mechanisms do not work efficiently enough or the amount of blood glucose is too great to be effectively managed. In these cases, medical intervention is necessary to restore homeostasis and prevent permanent organ damage. The human body maintains constant levels of glucose throughout the day, even after fasting. During long periods of fasting, glucose levels are reduced only very slightly. Insulin transports glucose to the body’s cells for use in cellular metabolic function. The cells convert excess glucose to an insoluble substance called glycogen to prevent it from interfering with cellular metabolism. Because this ultimately lowers blood glucose levels, insulin is secreted to prevent hyperglycemia (high blood sugar levels). Another hormone called glucagon performs the opposite function of insulin, causing cells to convert glycogen to glucose and stimulating new glucose production (gluconeogenesis) to raise blood sugar levels. Negative feedback between insulin and glucagon levels controls blood sugar homeostasis. People with type 1 diabetes do not produce insulin due to auto-immune destruction of the insulin producing cells, while people with type 2 diabetes have chronic high blood glucose levels that cause insulin resistance. With diabetes, blood glucose is increased by normal glucagon activity, but the lack of or resistance to insulin means that blood sugar levels are unable to return to normal. This causes metabolic changes that result in diabetes symptoms like weakened blood vessels and frequent urination. Diabetes is normally treated with insulin injections, which replaces the missing negative feedback of normal insulin secretions. Homeostasis of Glucose Metabolism: This image illustrates glucose metabolism over the course of a day. Homeostasis may become imbalanced if the pancreas is overly stressed, making it unable to balance glucose metabolism. This can lead to diabetes.